She was born to a house amongst the trees. Her first language was the language of the forest, a medley of slater and leaf and hummus and rain and more. Her first friends were faeries that lived behind bark and beneath ferns. From childhood, she was taught by her elders - humans, birds, storms - to weave forest shadows, dreaming winds, leaves and lost rivers, and to listen to the sun. Never did she think of skill, for this was a way of being rather than doing. It had no emblems, no poems. It was in the smoke she breathed, the tea she drank, the wild wise silence of mornings when she sat gathering story out of dirt and thresholds and insect tread and dusty books. But when she was older, others discovered the forest. They came with love and wonder amongst the trees. They saw her and her family and spoke of them - the ones who came before, they called them. And yet they never spoke to her. Enchanted by their personal wonder, they cared only for self-discovery and making the forest their own. They paved the shy, ferny paths that she had loved to converse with, feet and dirt sharing wisdom, way and walker in communion; they tramped from here to there and catalogued what they came across. They learned all the human names for trees. And she had no catalogues, no names, so she thought they must be wise indeed. She watched them build houses in the pines, write books about the root-pulse, announce new ideas she had known for decades. Slowly, she began to edge out of the forest. They had every right to be there, to love and to teach what they learned. The forest was not her sole property. Nevertheless, she felt like she was losing her home, her language, a deep layer of herself. How foolish, she thought. The people were making a community which loved the forest and wanted to care for it, understand it. This was a beautiful thing. And their songs for the trees, their discoveries about mushrooms and bird wings, resonated with her own heart. So she approached them, wanting to share her inherited wisdoms and be drawn into the community of Those Who Loved The Forest. But they looked down on her. She did not wear forester clothes, despite having been born there. She did not dance the sunbeams. No matter that she had long known things of which they were now claiming mastery. It was their path that mattered, their growth. 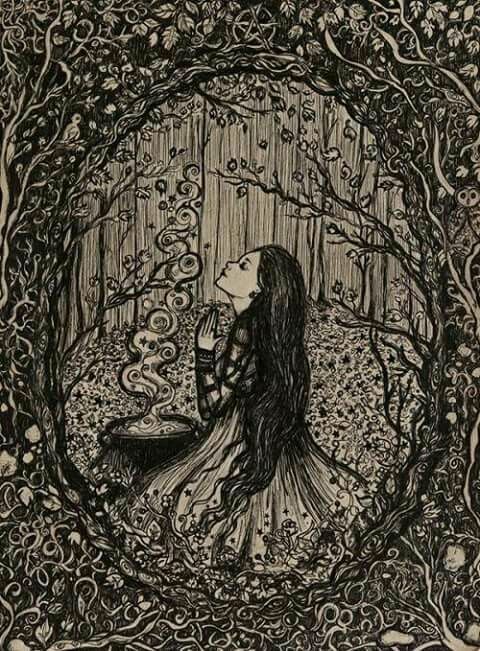 So she retreated again, until one day she discovered herself outside the forest, looking out over meadows instead. For many years she walked the long grass under raw blue skies, feeling homeless. But whenever she returned to the rim of the forest, she heard the people's drumbeat, listened to their lectures on earthmother-smokesong-treeheart, and she ran away again. The people belonged in the forest just as she did, but they did not welcome her to belong with them. And yet, pineshadow lay in her footsteps where ever she went. The scent of dirt freckled her dreams. When she wept it was riverwater overflowing; when she laughed it sounded of acorns falling onto stones. She had left the forest, but it came with her. It always would. Her heartbeat was its language. Her skin carried its long memory. This, then, was where she belonged: where she ever had. In her birthright, in intimacy, with the only conversation that mattered being the one between her and the trees. i am glad that she found the forest went with her, at least. Sarah, I am enjoying these stories so much.♥ I only wish I had the time to leave a comment on each one of them, but my days are very full now and my minutes on the internet few. I do want to tell you, though, about something I read recently in May Sarton's beautiful journal, Plant Dreaming Deep. In it she talks about writing and readers. Readers, she says, respond to what they recognize of themselves in someone's writing. I think there is much truth to that. The stories you have been writing on your blog lately have all touched a deep place in me--perhaps this one most especially.